For the town, see Batu Caves (town). The cave is one of the most popular Tamil shrines outside India, and is dedicated to Lord Murugan (Tamil God Murugan Tamil: தமிழ்க் கடவுள் முருகன்). It is the focal point of Hindu festival of Thaipusam in Malaysia. Batu Caves was promoted as a place of worship by K. Thamboosamy Pillai, an Indian trader. He was inspired by the vel-shaped entrance of the main cave and was inspired to dedicate a temple to Lord Murugan within the caves. In 1890, Pillai, who also founded the Sri Mahamariamman Temple, Kuala Lumpur, installed the murti (consecrated statue) of Sri Murugan Swami in what is today known as the Temple Cave. Since 1892, the Thaipusam festival in the Tamil month of Thai (which falls in late January/early February) has been celebrated there. Wooden steps up to the Temple Cave were built in 1920 and have since been replaced by 272 concrete steps. Of the various cave temples that comprise the site, the largest and best known is the Temple Cave, so named because it houses several Hindu shrines beneath its high vaulted ceiling. In August 2018 the 272 steps were painted in an extraordinary colour scheme, with each set of steps painted in a different range of colours. However accusations were almost immediately made by the National Heritage Department for a breach of law requiring authorisation for renovations within 200 metres of a heritage site. The temple's management disputed their failure to receive authorisation. Batu Malai Sri Murugan Temple is managed by the Board of Management of Sri Maha Mariamman Temple Devasthanam, which also manages the Sri Mahamariamman Temple, Kuala Lumpur and the Kortumalai Pillaiyar Temple. It also performs the role of Hindu Religious Consultant to the Government of Malaysia in determining the Hindu yearly calendar. There are various undeveloped caves which contain a diverse range of cave fauna, including some unique species, such as Liphistiidae spiders and Eonycteris and fruit bats. The site is also well known for its numerous long-tailed macaques, which visitors feed — sometimes involuntarily. These monkeys may also pose a biting hazard to tourists (especially small children) as they can be quite territorial. In order to maintain the cave's ecology, access is restricted. The Malaysian Nature Society organises regular educational and adventure trips to the Dark Wet Caves. Icons carried in procession during Thaipusam at Batu Caves. Also seen in the background is the 42.7 m high golden statue of Lord Murugan. 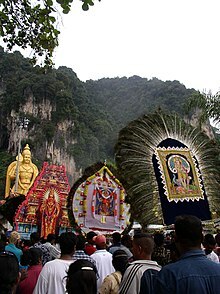 The Batu Caves serve as the focus of the Hindu community's yearly Thaipusam (Tamil: தைபூசம்) festival. They have become a pilgrimage site not only for Malaysian Hindus, but Hindus worldwide, from countries such as India, Australia and Singapore. A procession begins in the wee hours of the morning on Thaipusam from the Sri Mahamariamman Temple, Kuala Lumpur leading up to Batu Caves as a religious undertaking to Lord Muruga lasting eight hours. Devotees carry containers containing milk as offering to Lord Murugan either by hand or in huge decorated carriers on their shoulders called 'kavadi'. After bathing in the nearby Sungai Batu (Rocky River), the devotees make their way to the Temple Cave and climb the flights of stairs to the temple in the cave. Devotees use the wider centre staircase while worshippers and onlookers throng up and down those balustrades on either side. When the kavadi bearer arrives at the foot of the 272-step stairway leading up to the Temple Cave, the devotee has to make the arduous climb. Priests attend to the kavadi bearers. Consecrated ash is sprinkled over the hooks and skewers piercing the devotees' flesh before they are removed. No blood is shed during the piercing and removal. Housing development began around 1970 with housing estates such as Taman Batu Caves, Taman Selayang, Taman Amaniah, Taman Sri Selayang, Taman Medan Batu Caves and Taman Gombak Permai. In the last decade, the surrounding area has changed from a small village to industrial estates, new housing and retail. There is also an elevated flyover across the highway. A new 515-million-ringgit KTM Komuter rail extension from Sentul to Batu Caves began operations in July 2010, serving the rebuilt Batu Caves Komuter station. On 1 January 2011, during the Thaipusam festival, it was announced that a cable car would be built for the following year's festival. It would cost around 10 million ringgit. Batu Caves is easily reached by commuter train at the KC05 Batu Caves Komuter station, costing RM 2.6 for a one-way journey from KA01 KS01 KJ15 MR1 KE1 KT1 SBK15 KL Sentral. 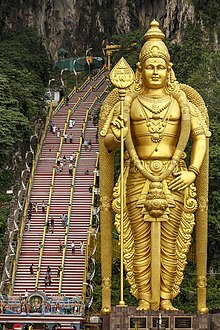 Batu Caves may also be reached by bus 11/11d from Bangkok Bank Terminus (Near to Puduraya Terminus) or bus U6 from Titiwangsa. 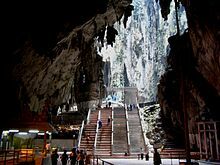 Batu Caves is also easily reached by travelling by car. ^ Bavani, M. (30 August 2018). "Batu Caves temple committee steps into trouble". Star. Retrieved 31 August 2018. ^ "Temple gets stunning paint job (shame it might be illegal)". BBC. 31 August 2018. Retrieved 31 August 2018. ^ "Cable car service in Batu Caves next year". New Straits Times. Kuala Lumpur. 16 January 2011. Archived from the original on 29 June 2011. Retrieved 14 April 2011. ^ "RM10 mil cable car for Batu Caves". Malaysia Kini. 20 January 2011. Retrieved 14 April 2011.